I feel kind of awkward now. Clixsense, my favorite ptc website, has lost its PayPal membership due to changes in PayPal’s terms and conditions. As Clixsense’s administrator said in a recent announcement ” they will not bring PayPal back as a payment processor. I recently wrote an article on how BuxP – another trusted and legit paid to click website – was removed by the privilege of having PayPal as a payment processor. At that time, I thought that it was just an isolated incident. PayPal started its ”removal” from the ptc word a year ago. At that time PayPal was evaluating ptc websites and if they deemed that it was a scammy ptc, the removed them the privilege of having PayPal as a payment processor. Clixsense’s admin contacted PayPal back then to hear if he was ”in danger” of losing PayPal from Clixsense. PayPal assured him that Clixsense was not in danger of loosing PayPal as a payment processor. After about one year though, PayPal’s policy changed radically. PayPal is removing it self from the PTC business model as it considers it to be a ”shady” method of earning money. To be honest, 90 percent of ptc websites that are ”born” online, they are not surviving more than a year online and they scam people. Legit ptc websites are ”going down on this” with the scam ptc sites. Below you will find Jims (Clixsense admin) post about this subject. Members, I am reposting this as we’re still getting a lot of questions about PayPal. The situation has not changed and we will not be bringing PayPal back. On Monday February 6th PayPal placed a hold on our account. They advised me that due to new policy changes the ClixSense business model was now in violation of their user agreement and we would have to stop processing all payments (in and payments out). I have had several conference calls with PayPal over the last few days trying to convince them that we’ve posed no risk for the last 7 years since we’ve introduced them, and even our account rep agrees, but in their eyes it did not matter. On Tuesday afternoon February 7th I was told I would get a definitive answer that night or Wednesday February 8th if we would be able to continue with them for at least mass pay cashouts. I received the call Wednesday morning that they are not allowing us to process with them any more. If you haven’t noticed, the option to pay by PayPal has been removed from the site. While this is definitely a set back, it certainly does not mean you will not get paid. I highly suggest that if you are using PayPal, to switch to Payoneer. They can send your funds directly to your bank account or to their debit card. We also suggest you try Tango Card or Paytoo as they have many options for you too. We have been accepted by Skrill and have started the integration with them and I am doing everything I can to bring Payza back as well. We have had many requests for Bitcoin but what many of you do not realize is you can get your payment by Bitcoin if you choose to cashout through Tango Card so please be sure to check into that. We know this is a major inconvenience but as the old saying goes, what doesn’t kill you will only make you stronger. 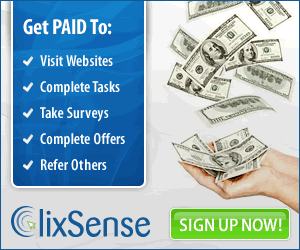 ClixSense will continue to move forward and we will do our best to give you the great service that you’ve come to know. What are your thoughts about PayPal’s policy to not allow any PTC website to use its payment processor. Do you agree or do you find their policy justified? Leave your comments below and let us start a conversation.